Your account dashboard is the first page you see when you login to your WebStarts account. It’s a central location where you can manage your account and website settings. From here, you can select the site you wish to edit, manage your domain names, and update your account settings and billing information. Selected Website: Click the Site Selection bar to toggle between the different websites on your account. Notification Center: The Notification Center displays important messages from Webstarts about your account. Profile Picture: Click on the arrow to the right of your Profile Picture to re-load your Dashboard, access your Account Settings, Billing, and manage My Domains, get Help, or Log Out of your account. Note: You can change your Profile Picture in the "Account Settings" tab. Site Preview: In the center of your account dashboard, you'll see a thumbnail preview of the selected website. Below that is the link to the URL of your website. This is the web address that you can use to view your website live online. Edit Site: Clicking this button will load the Webstarts Editor for the website selected. 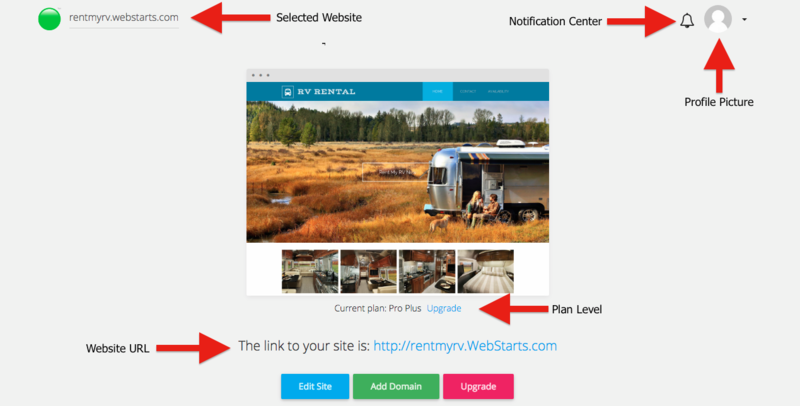 Add Domain: Here, you can add a domain to the selected website. Upgrade: Click this button to upgrade your account to a plan with more features and tools for your site. Store: Add the Webstarts Store to your site to sell products online. Blog: Add, edit, and manage your blog here. Analytics: Activate Analytics to track visitors to your site. Traffic Booster: Submit your site to the search engines and get more traffic. 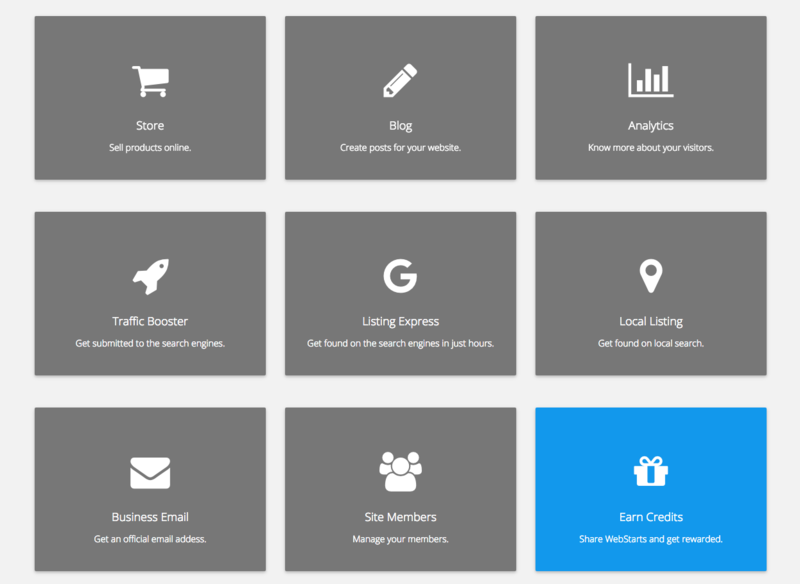 Listing Express: Get your site listed on search engines in hours instead of waiting weeks. Local Listing: Get listed on local search results, including Google Maps. Business Email: Create and manage a custom email address with your domain (ex: yourname@yoursite.com). Site Members: Add a membership feature to your site and manage your site members. Earn Credits: Earn credits towards your Webstarts account by telling friends and family about Webstarts.